My dear friend Sharon Holland has published a book, and I'm so happy to share it with all of you today! Utility-Style Quilts for Everyday Living is full of simple, lovely patterns that are somehow both modern and timeless. I particularly love Sharon's emphasis on enjoying the process without getting stuck on perfectionism. She really wants to inspire us to make quilts that will be used and loved. I shrank the Cabin quilt pattern, which is featured on the front of the book, down to make an 18" pillow cover. As many of you know, I'm a huge fan of the log cabin block. It's easy to sew, wonderfully forgiving, and always looks fabulous. Using prints instead of solids and reversing the order of colored and low volume stripes, I made a patchwork cover that fits my style perfectly. 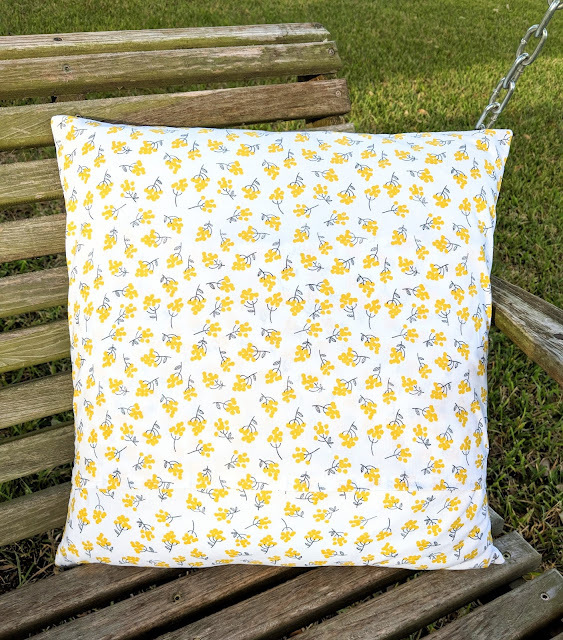 The pillow is backed in a cheery Lotta Jansdotter print dotted with yellow flowers. It looks great on our family room couch, and my girls love the cupcakes featured in the center of the pillow! Along with the book, Sharon has a free pattern available for the Roman Stripe Quilt. It's a beauty, and you can download it right here. She's also giving me a copy of her book to give away to one of my readers. Just leave a comment below, and you'll be entered into the drawing. This one is only available to U.S. residents due to shipping costs. (Sorry international readers -- you know we love you!) I'll choose a random winner on Wednesday night. Of course I would love to get a chance to win this book! I, too, love log cabin blocks. I've made a bunch. This book is just my style. Your pillow is charming! I never tire of log cabin blocks! Love to win the book, I really like Sharon's style. That Sharon is one busy gal!!!! I am so looking forward to this book, and would certainly adore winning a copy! Your pillow is a darling adaptation of her stunning cover quilt! Looks like a great book I need to have! Your pillow is beautiful! The book looks fantastic! Simple beauty is always best in my eyes. I'd love to win, I really like simple quilts. Thanks! This book looks lovely! I love when designs can be mad either modern or more traditional depending on your fabric choices! Love your pillow, and the books sounds just fabulous !!! Lovely pillow! Great fabric choices as well. Can’t wait to see more on the tour! HI,Your pillow is so charming! I love log cabin blocks! Excited about Sharon’s book and love the pillow you made! Heidi, Log Cabins are my favorite block to piece and yours is sweet like a sweet tooth. Love the mix/reversal of low vol & prints, nice rendition. Thank you so much for sharing and I can see why your girls love that cupcake center. I like the fussy cut center too. I super love your pillow! This books looks fabulous!!!! Beautiful pillow. I'd love to win the book!! Such a cute pillow! The book looks wonderful! thank you! OMG, that pillow is so sweet! Thanks for sharing! Sharon Holland has always been a great inspiration to me, so I know I'd love to have this book! I really love that pillow and could see it make in seasonal colors in my home! 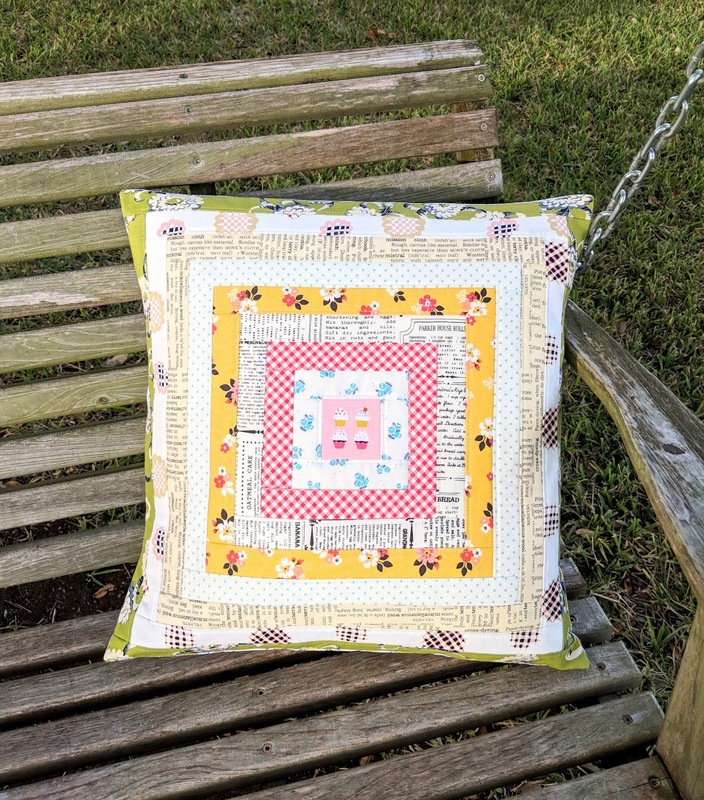 Love your log cabin pillow project, looking forward to exploring this pattern and others from Sharon's new book! Looks like a great book for any quilters library. Thanks for sharing the giveaway! I would love to win a copy. Looks like a great book. Thanks for the chance. I would love to add this to my quilting library. I am looking forward to seeing the projects of this book tour. From what I have seen the projects look fun to make and enjoy. Your pillow block is fantastic. I love log cabin blocks too. The log cabin block is what made me want to start quilting! I love its simplicity and endless possibilities. I think I need to see another one soon, love the idea of a pillow. I love your pillow, yellow is my favorite! Sharon's book looks lovely too! What a beautiful.pillow. I would love a chance to win a copy of Sharon's book. Another beautiful project created by you, Heidi (I can never get enough of text prints or polka dots!). Would love to see what's behind that gorgeous cover! One of my all time favorite blocks on the cover! Sounds like a good. Love to have it. I love your pillows! I am a big fan of Log Cabin blocks so this is perfect. I would love to see more of the book. I would love this book! Thank you for the free pattern too. Love your pillow with the cupcake center. This looks like a great book. This is a great idea for a book. I tend to make quilts and stand back and admire them! Love the backing fabric. I must search for that. Looks like this book is a great book! Lots of practical uses!! I like your pillow. It’s traditional but with a modern feel because of your fabric! Nice! 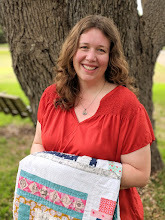 I love quilting books and would love a look inside! I like to use my quilts, so practical sounds intriguing! Those quilts look so interesting. I'd love to win the book. Thanks. I love the prints you chose. I agree with your daughters about the cupcakes! Utility Quilts are the kinds I like to make. I hope I win. Thanks for the opportunity. Thank you! The pillow is begging to be loved!! I love log cabin blocks. This looks like a book that I would actually use. Thanks for giving one away. Love your pillow! It is beautiful! Your pillow is so pretty. I love any version of log cabin blocks. And the book sounds great. Many times a simpler quilt can let the beautiful fabric shine even more. And of course.....needs to feel it can be used! I love quilt books, so much inspiration to see! Your pillow is lovely, log cabins are always a winner in my book. Love log cabin blocks - they offer so many options for individual design preferences. Great looking book. Your pillow is so very cute and happy looking! It is appropriate even for old ladies. Who doesn't love something sunny and happy looking? Thanks for sharing your thoughts on the book. Love your pillow. I like log cabins too! 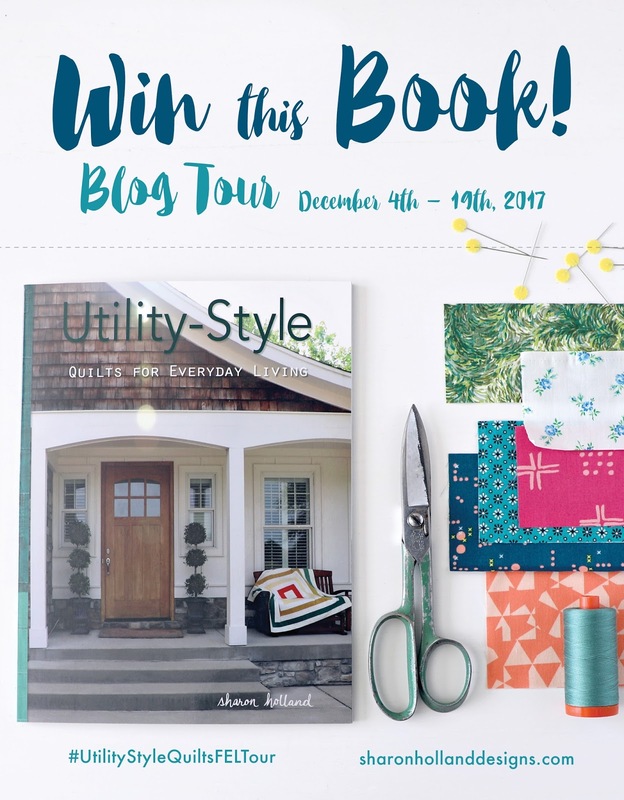 Would love to win the book--A Log Cabin quilt is on my bucket list! Love the way you shrunk down the quilt to that great pillow. This book looks so inspiring! Thanks for a chance! As a new quilter, these patterns look right up my alley. Hi Heidi, My very first quilt (aside from a puff baby quilt) was a log cabin in red, white and blue prints. I would love to win this book, it looks great! Thanks. 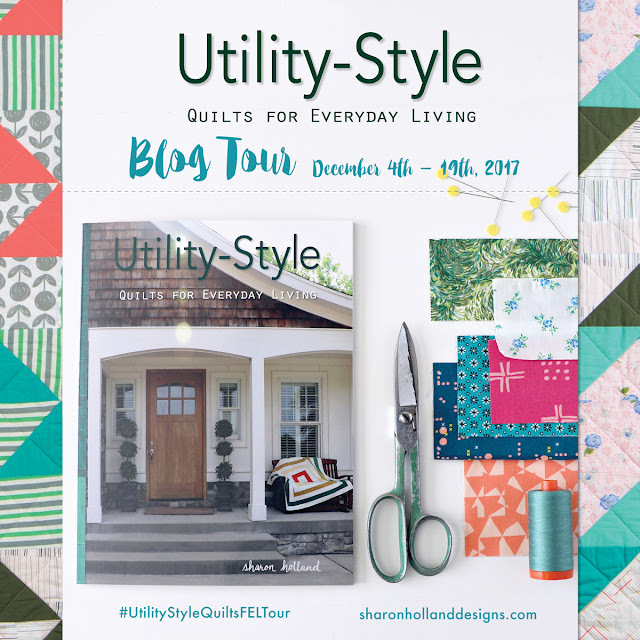 This looks like such a great book - I love the style of these quilts! 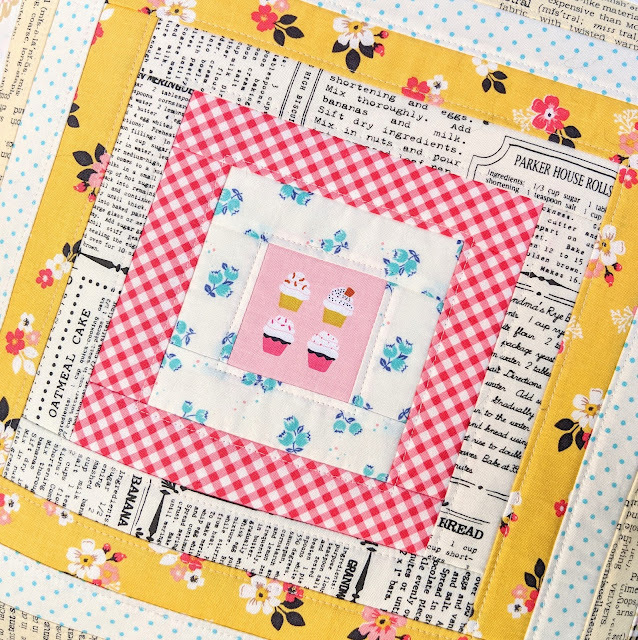 Love your creative idea of shrinking the pattern to create something different. The book will make one lucky person ecstatic. I think I am the only quilter who has not tried a log cabin. I love how they look, I just haven't gotten there yet. Useful and beautiful quilts. Love the pillow. And a new and different quilt book. Awesome! Great pillow idea. Quilts should definitely be used and loved! I love this book’s message... most quilts should be used, cuddled with and loved! Would love to win, thanks for the opportunity. Great idea to shrink it down for your pillow. Love the fabric choices - a really fun and inspiring project and book. Love the pillow. Thank you for the giveaway! I have been waiting for this book to be released! So exciting. The projects look like fun! Your pillow is too cute! This book looks like it's for me!. Thank you for the opportunity to win. Beautiful project from a very neat book! Very beautiful book. I also make quilts meant to be used, so this is perfect! This book looks amazing. I hope I win. The quilts are so unique! What an interesting book! Thanks! This book looks great! Thanks for sharing. Pretty pillow! The book looks great! I would love to win, thanks for the opportunity! Congratulations to Sharon on her first book. Would love to win a copy. I love your pillow Heidi. Your work is always so gorgeous. Fabric choices are spot on perfect too! This looks like a great book. Your pillow is lovely. Thanks for sharing and the giveaway. I love scrappy quilts for donation to the local nursing home. Your free pattern is great. This is a wonderful book filled with quilt patterns meant to be warm, daily hugs! Looks like a book I need! Thanks for the chance to win and Merry Christmas!! Looks like a great book! Thanks for the giveaway. This book looks awesome! Thanks for the opportunity! Looks like a great book. I really like the use of newsprint fabrics as low volume background prints in your log cabin pillow. I would love a chance to win the book. Love your pillow! Thanks for the chance to win! Love your pillow, mine would be purple based for my favorite chair. Thank you for the free pattern. Looks like one my mother can sew. She is 88 and is doing simpler ones and I am going to try it in Green. 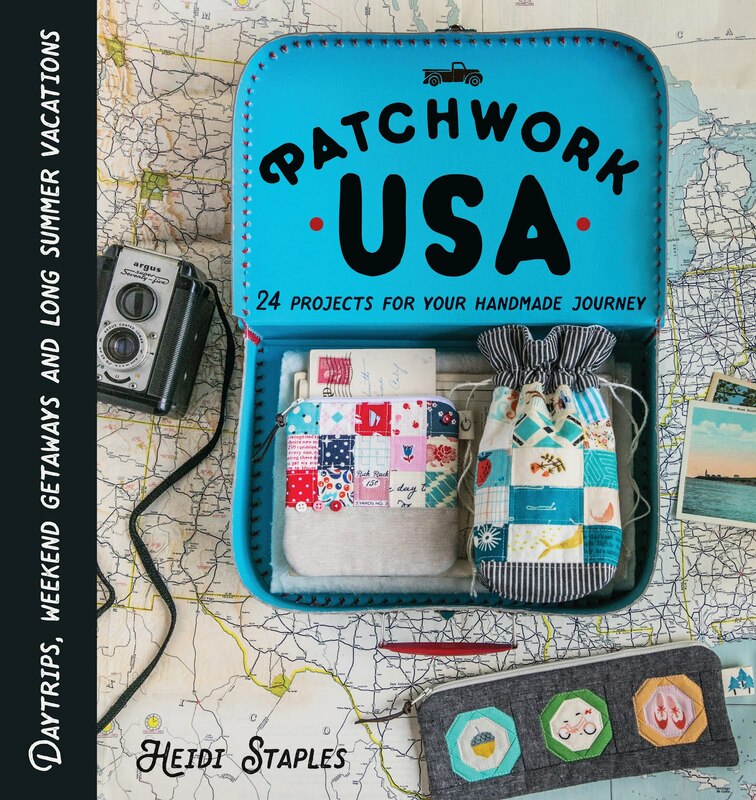 I'm afraid I'd have to make all the quilts in this new book!